Simon's sister, Rebecca, comes to visit and they go out for Halloween. Jace, Isabelle, and Clary fight demons on the streets. Jordan hangs out with Maia at the Hunter's Moon. Alec goes to a warlock to channel Asmodeus. He tells Alec he'll give Magnus his powers back if Alec breaks his heart. The heavenly fire isn't strong enough to remove Clary's rune, so Izzy decides to make a more potent serum. Clary goes off on Izzy because of her connection to Jonathan, but Jace is there to pull her back. Magnus helps Maryse decorate her shop. The Seelie Queen gives an order to kill Jonathan, which will, in turn, kill Clary. Alec tells Isabelle that he's going to break up with Magnus so he can get his magic back. Rebecca goes outside to make a call, and Isabelle saves her from a demon attack. Rebecca realizes that Simon and Izzy have feelings for each other, so she volunteers Simon to go help her. Clary is knocked out by a demon and sees Jonathan. Because of their connection, she lets him in. Maia asks Jordan to stay and be her second in command. Simon and Isabelle almost kiss but are interrupted by a breach in the wards. 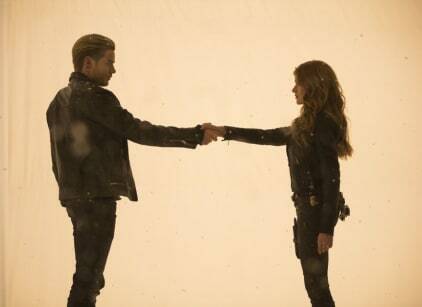 Clary knocks Jace out and rescues Jonathan. Alec breaks up with Magnus. Asmodeus controls the warlock and uses her to summon him. He kills her and goes to find Magnus.